Key Difference: The main difference between a RO and UV purifier is in the process used by each for purification of water. 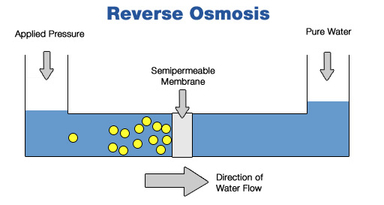 In RO (Reverse Osmosis), the water molecules move from a region of higher concentration to lower concentration using the force of incoming water and is passed through a membrane, after which the waste water and impurities are discharged through an outlet. Whereas in UV, the Ultraviolet Rays kill the germs and microbes present in water. With the increasing concern of water pollution, the need of water purifier has risen and so also has their demand simultaneously. The two most popular kinds of purifiers available in the market are: RO and UV purifiers. RO uses the method of reverse osmosis to eliminate dissolved impurities, heavy metals and chemicals from water. Heavy metals and other harmful chemical present in the water can affect your health adversely. UV water filter system kills all the bacteria’s and germs present in water, making it free from any kinds of pathogen. Let’s categorise the difference between both RO and UV purifiers in length. RO water purifiers make use of semi-permeable membranes through which only water molecules can pass through and physically removes all kinds of impurities from water. The filtering holes of RO membrane is so small that even dissolved salts cannot pass through them. The water is free of any kind of germs, virus or bacteria making it very hygienic. But in case of UV purifiers, the ultraviolet lamp kills the germs and other living organisms but fails to remove their bodies from the water. UV water filters are not capable of separating dissolved solids from the water. UV water purifier disinfects the water eliminating chances of water-borne diseases but cannot free water of any dissolved chemicals and heavy metals. Care needs to be taken that the UV bulb needs to be kept clean free of any kind of dirt or algae deposition for the UV light to work effectively. When you get your water supply from a source which has processed the water before it reaches your tap, that means it has low TDS content. TDS means total dissolved solids which your water may contain. In this kind of situation, a UV purifier is enough to suffice your need. UV light will kill the water born bacteria making it safe for drinking and free of any kind of health effect. In cases where the water is not processed and is simple groundwater with high TDS content, RO purifier is to be used. High TDS content is very harmful your health and can cause disease related your kidney and digestive system. In such situations UV purifiers fail to work because they cannot remove the dissolved impurities and can lead to harmful effects on your body. RO purifiers can work with muddy and dirty water and can purify it effectively. Whereas in case of UV purifiers, the water needs to be clean for the ultra violet light to pass through and kill the germs and bacteria fully. Both RO and UV purifiers require electricity to work. But in case of Ro purifiers electricity is needed to boost tap water pressure whereas UV ones can work fine with normal tap water pressure.RO purifiers require more water for purification. Uses reverse osmosis for water purification. Can remove dissolved impurities like heavy metals, chemicals, germs etc from water. Can only remove pathogens from water. Works best with water high in TDS content. Works best with low TDS content water. Can work effectively in dirty and muddy water. Cannot function in dirty and muddy water supply. Requires electricity to boost tap water supply. Works fine with normal tap water supply. More water is needed for the purification process and also more water is wasted by the purifier. Less water needed and wasted as compared to RO purifier.